A former prisoner was jailed for at least 19 years for stabbing to death a young man in front of his girlfriend. Jack Mallon (47) was given a life sentence for the murder of 20-year-old Jordan MacKay after plunging a knife into the victim’s neck leaving his girlfriend screaming for help. Mallon’s ex-girlfriend, Charlene Wilson (37) who had summoned him to South Queensferry was jailed for nine years for her part in Mr MacKay’s death. She had stood trial for the murder of the joiner with her co-accused Mallon but was convicted of the lesser charge of culpable homicide. Mr MacKay had been on a night out with his girlfriend, Nicole McKay (21). The judge said that Mr MacKay had “no chance” to defend himself from the knife attack. Miss McKay said her boyfriend was losing a lot of blood and could not speak in the wake of the attack. 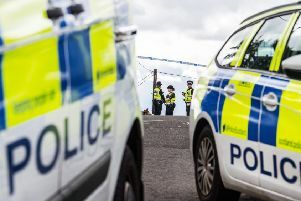 Mallon, who was previously jailed for drug crime, and Wilson had both denied murdering joiner Mr MacKay, of Kirkliston, in the attack in the early hours of July 13 at The Loan, South Queensferry . Mallon had lodged a special defence claiming he was acting in defence of himself and his co-accused. Mr MacKay and his girlfriend had been socialising in the town where Wilson was also drinking. Mallon later arrived in South Queensferry by car after Wilson contacted him. Wilson (37) from Kirkliston, had been at the Stag’s Head in South Queensferry and had shouted at Mr MacKay’s girlfriend who “laughed it off” the court heard. One witness said that as they were leaving the pub Wilson tried to slap Mr MacKay. Footage of the incident outside the pub was caught on CCTV and mobile phones.